Thick Sections of UV Adhesives. Ultraviolet curing adhesives are widely used in optical lamination of precision optical lenses, safety windows, holographic displays, and flat panel displays. In most of these applications they are being used in relatively thin films from 3 microns to 40 mils, because most formulations will only allow UV light to penetrate to a certain depth. If the formulation does cure in thicker sections, the stress due to shrinkage typically becomes a problem. UV adhesives have been developed which can be cured in relatively thick sections with minimum stress. In this paper, a number of formulations are compared for variations in stress when cured in thick sections and the conditions and mechanism to minimize stress are characterized. This paper discusses work done in conjunction with formulating a UV curing adhesive for laminating touch screens to cathode ray tubes used for computer displays. 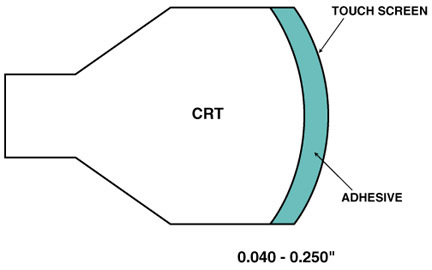 CRT's provide a challenging laminating process because of their large curved face. Problems arise because the tolerance between the CRT and the touch screen are difficult to match. Some areas will be in close contact while others may be separated by 1/8 inch. Manufacturers in the past have overcome this problem using a thick layer of a slow curing epoxy. The process entails mounting the touch screen on the face plate with a thick compressible gasket on at least three sides to form an enclosed area for filling with adhesive. The gasket which can be up to 1/4 inch is used to minimize any differences in adhesive thickness. The epoxy typically cures at room temperature for 24 to 48 hours and compresses the gasket as it draws the two surfaces closer together. A UV curing adhesive was desired in this application because of the great savings in production time. But first some considerations of its curing characteristics had to be made. UV curing adhesives are typically used in thin films, because most do not cure well in thick sections or if they do, the stress due to shrinkage becomes a problem. Shrinkage does not always cause stress if handled correctly. In most UV curing applications the adhesive cures from the surface down. If there is a uniform bondline and uniform UV exposure, as the lamination cures, the two surfaces will be drawn closer together creating very little stress. If thicker layers are cured, we can no longer think in terms of linear shrinkage but must consider it on a volumetric basis, shrinking in all directions. This can be a problem because UV adhesives cure so quickly that neither the adhesive or the surfaces can equilibrate fast enough to prevent stress from occurring. 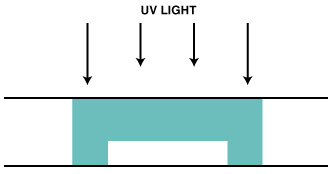 Drawing on an analogy to epoxy, it was theorized that if the UV adhesive could be formulated to allow a more uniform cure throughout the adhesive, similar to the way a two part epoxy cures all at once throughout the product, it would have more of a chance to equilibrate itself and minimize void formation. Literature describes a number of photoinitiators that are designed for a depth cure as opposed to a surface cure. These materials tend to be non-fluorescing and are very efficient, only absorbing the UV energy that they need and allowing the rest of the energy to pass all the way through. Previous experience led to quick identification of a range of appropriate materials. 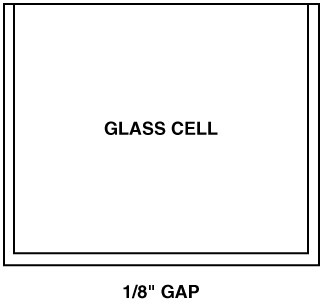 To approximate CRT/Touch Screen laminations, 4" X 6" glass cells were made using silicone sealant around 3 sides of the plates to create a 1/8" gap. Three UV curing formulations were tested to find a suitable replacement for the 24 hour epoxy which had been used. The first was a standard grade low shrinkage UV adhesive (NOA 61). The second (NOA 73) was a new formulation designed to cure well in thick sections. The third formulation (1050-87) was similar to the second except the concentration of the photoinitiator was decreased to provide a slower cure. Samples cells were filled with these UV adhesives and placed in front of a uniform low intensity UV light (1200 microwatts/cm) for 15 minutes. Low intensity was used to provide time for the adhesive to equilibrate during the cure. Cure and shrinkage in the form of void formation was observed during the exposure. Sample 1 (NOA 61) appeared to proceed smoothly for the first 5 minutes. But as the cure proceeded to the full depth of the cell, small areas began shrinking away from the surface causing large voids to appear. (Illustration 1). For sample 2 (NOA 73) the results were much better but again near the end of the process areas at the surface of the adhesive started to shrink and create voids at the edges. (Illustration 2). Sample 3 (1050-87) was exposed for the same amount of time and showed neither appreciable void nor stress formation. (Illustr. 3). All three samples were believed to have similar shrinkage rates. But sample 3 had been optimized to minimize potential stress formed during shrinkage. Two further tests were done to determine what characterized this difference in the cure. Samples were UV cured using an intensity of 1500 microwatts/sq. cm of UV light in a Perkin Elmer Model DSC-7 Differential Scanning Calorimeter. The exotherm was measured for each sample at 25°C and the alpha, or rate of reaction, was calculated by integrating the area under the exotherm curve. Results are shown in graph 1. 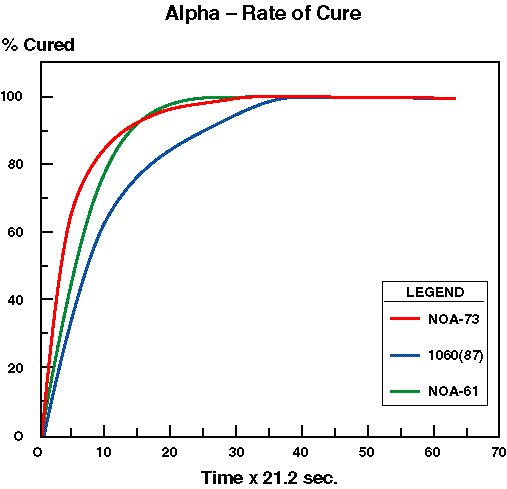 Comparing samples 1,2 and 3, each progressively higher sample shows a broadening of the alpha curve which indicates a slowing of the cure rate. But the change does not appear to be significant enough to fully explain the change in cure and stress formation. It is believed that because only small samples were allowed in the calorimeter, the test was not appropriate for observing differences caused by a thick cure. A device was made to allow measurement of the depth of cure after various UV exposure times. 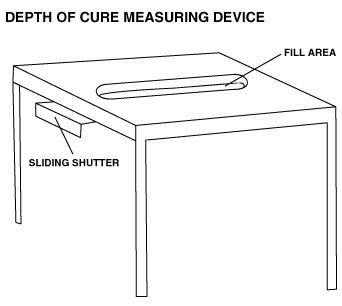 This would provide data on thickness as a function of the rate of cure. The device was composed of a 1/2" x 6" cutout in a plastic substrate that was 5/8" deep. This was supported on two sides with 8" legs. A clear cellophane tape was attached to the bottom of the cutout to form a mold that could be exposed from below. A sliding shutter was installed underneath the cutout to allow the length of the mold to receive different exposure times. 25 gms. of the UV curing adhesives was placed in the mold and centered over a fluorescent black light emitting 1000 microwatts/sq. 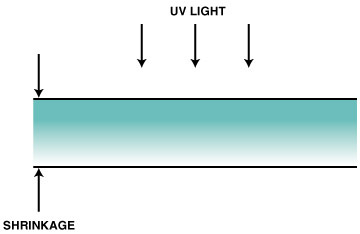 cm of UV light. The entire length was exposed for 30 seconds before the shutter was moved to block 1" of the mold. Exposure times were doubled for each consecutive exposure with the shutter moving another 1" each time. Exposure intervals were 30 sec., 1, 2, 4, 8, and 16 minutes. After completion of the cure cycle, uncured adhesive was poured off the top surface and a gentle acetone wash was used to rinse away any uncured liquid left. The sample was removed from the mold and thickness measurements of the different exposed segments were made. The resulting data is shown in graph 2, which shows a drastic difference in the formulations. With the low intensity UV light the first sample was never able to cure to more than 50 mils. 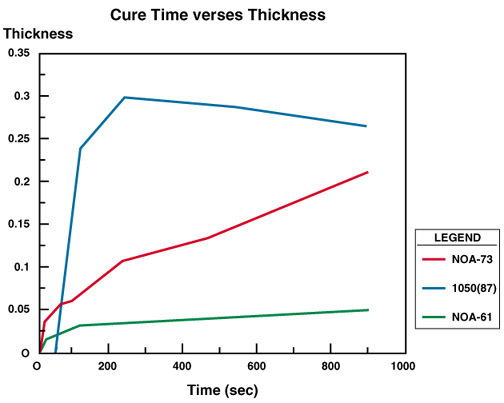 The thickness increased at a steady, proportional rate to the exposure time indicating a cure from the surface toward the center. Sample 2 showed a much more efficient through cure for the same exposure time. Total thickness was over 200 mils and the thickness increased steadily in proportion to the exposure time. Sample 3 showed the most difference. Total thickness was the highest for this material, averaging over 250 mils, but the shorter exposures did not have an appreciable effect on film forming. Film thickness was not measurable until 120 seconds of exposure at which time it was close to 250 mils. It appears that the cure was occurring uniformly throughout the film on initial exposure but was not sufficient to fully polymerize the material until a certain minimum exposure had occurred. It was also found that the total thickness reaches a maximum at 240 seconds, in the middle of the cure cycle, and then begins to shrink. This is a further indication of a more uniform through cure in which the polymerization occurs on a constant basis and the entire thickness shrinks at the end of the cure cycle. It has been shown in this set of experiments that minimizing stress in curing thick sections of UV adhesives requires the ability of the formulation to cure throughout the thickness at a relatively uniform rate as opposed to curing from the surface down. The proper choice of the reactive polymers, photoinitiators, and UV light intensity, can all be optimized to provide an efficient through cure. 1. Baeumer, W., "Selection criteria for photoinitiators," Kontakte(Merck),1989(3),42.